This picture has been reminding me that there was a time in life when I appeared to be carefree and silly. How often do we allow ourselves that luxury the more and more we "mature?" I have a friend in Northern California, Charlene, who has never lost her ability to see life as an adventure. 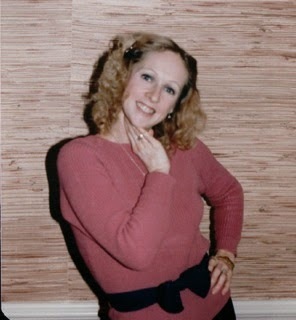 Even when Charlene lost her husband, her friends and family rallied around her and she continued to live. Not all of us have great family, but we can take the time to make great friends. Sometimes it seems as we age, we allow all of the pot holes of our past to convince us that our future is filled with pot holes also. No smooth roads ahead. Struggling with health issues, relationship disappointments, betrayals by friends or family, a dead pile of dreams to bury ... and the list goes on. We have to remind ourselves that we are new creatures in Christ ... old things have passed away (2 Cor. 5:17). STOP trying to fix your future by filling in pot holes of your past. Leave those roads behind you and travel with your focus ahead and not behind. Fix your eyes on Jesus and the new you inside. Christ died to give you a new abundant life (John 10:10). It's easy to get stuck. The devil will whisper disappointment and despair into your head and you will begin to feel that the "good life" is over and it's just a slow journey to the grave. Look up! Jesus is the author and finisher of our faith (Heb. 12:2). Through Him we can live life more abundantly. We can hope, we can build new dreams, we can move forward. Those who have contributed misery to your life can be left behind. They certainly aren't allowing their lives to be affected by you. Why would you want to give your life away for them? Begin now to write a new plan for your life ... a new direction ... new goals, new dreams. Wake up each day with, "Good Morning, Lord! What do you want to do today?" Hang close to Jesus and He'll introduce you to some really awesome people. You've got to get the show moving though ... get out there in the world and sniff it out and find a new bone to enjoy! It takes me a few days to put this newsletter together, so I'm in the last days of April and the heat's been running all day today. It's hard to imagine that it's going to be May and we still don't have steady Spring weather. Bunnies were doing their bunny dance in the back yard. I didn't want to miss a minute of it so I didn't go for the camera, but YouTube has a good video. View a video of the Bunny Mating Dance. Wrens are definitely nesting on the front porch in the frog bird house. Mr. Wren is carrying food to his Missy while she sits on the eggs. As mentioned above, it's not warm enough weather for the eggs to be exposed. So she gets her meals served on an open platter (or mouth). Since the base of the frog bird house is a circle of wood that the frog is sitting on, Mr. Wren has a place to sit and feed Mrs. Wren while we watch. It's such a sweet scene! But I like this one. I think he's giving her a kiss. I couldn't sleep a couple nights ago and was in the dining room when I heard banging on the front porch. Usually some kind of critter, so I went to the front door and opened it to find a young raccoon on the post that the bird house hangs on. His legs were too short to reach around to the front and swinging at it didn't turn it around. Thank you, Lord! I chased it away and had to wake Randal to get a stool and move it to another hook out there that the raccoon couldn't get to at all. Boy, did that shake me up and wake me up even more. The Gray Catbird arrived on the 20th of April. View one of my favorite Gray Catbird photos. I've heard him mewing softly which is generally what the males do while the female is nesting. 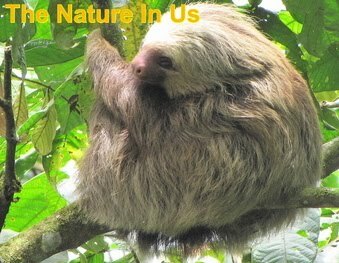 I have not looked around for a nest so as not to leave human scent to attract other predators. The Catbirds have had a couple of losses when it comes to nests. Don't know why they have been so challenged. We have an abundance of male Northern Cardinals. I know we birthed a lot of cardinals last year here and now they are in competition for the nesting territory. They have been like red flying fighter jets with 2 to 3 of them speeding this way and then that way. Sometimes at tree level in clear areas and then near ground level when they fly into the pine and cedar bank area. It's amazing to watch! 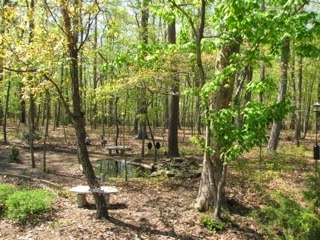 From the screened porch I can view the deck birdbath and so enjoy seeing the birds drink and take baths. One thing evident amongst them all is the watchfulness they have of the arrival of any predator. We do have three (3) species of hawks (Coopers, Sharp-shinned & Red-shouldered after a catch of a frog from the pond) plus we've seen a Red-tailed now and then. As you can see from the feet of these birds, an attack with those claws plus their beak is deadly. "So he brought down the people unto the water: and the LORD said unto Gideon, Every one that laps the water with his tongue, as a dog laps, him shall you set by himself; likewise every one that bows down upon his knees to drink. And the number of them that lapped, putting their hand to their mouth, were three hundred men: but all the rest of the people bowed down upon their knees to drink water. And the LORD said unto Gideon, By the three hundred men that lapped will I save you, and deliver the Midianites into your hand: and let all the other people go, every man unto his place." Those men knew that they couldn't be down on the ground to drink. What a vulnerable position to be in. What an interesting way for God to help Gideon choose soldiers also. The way the birds drink remind me of those soldiers. God put a built-in instinct in them to always be on guard. They quickly dip their beak and pop back up to look around before another and another quick drop of water. It takes awhile for them to finish, but it's better to be wise than being "finished off" yourself. I Peter 5:8 tells us to "Be sober, be vigilant; because your adversary the devil, as a roaring lion, walks about, seeking whom he may devour." We surely have been given the same ability to be alert to danger at all times, but we are so used to living by our senses that we often don't see the devil's subtle ways. One definition of subtle is this: requiring mental acuteness, penetration, or discernment. We really need to be on guard at all times. Like the birds being alert to stay alive, we too must become more acute in our mental awareness of what's going on around us. The devil will twist the Word of God just as he did with Eve. He can't get us to deny Christ, but he can make us doubt His goodness and love for us. He can make it seem that God is doing all the evil things in the world instead of himself. We have to know what the Word says inside and out so we can stand our guard. Sadly, most folks don't spend much time in the Word. There's so many more entertaining options such as devotionals and television shows. If you're listening to somebody who is teaching directly from the Word you will learn things ... but there is nothing to substitute the relationship we get when we dig deed into God's Word to us. By evening most folks don't remember the morning devotion they read because it was just words. 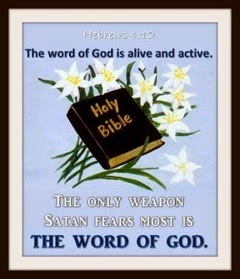 But the "Word of God is alive and powerful. It is sharper than the sharpest two-edged sword, cutting between soul and spirit, between joint and marrow" (Hebrews 4:12). God says, "My word that goes out from my mouth: It will not return to Me empty, but will accomplish what I desire and achieve the purpose for which I sent it" (Isaiah 55:11). God's Word is creative. 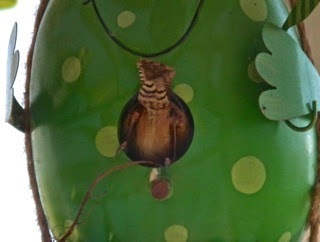 Back to our birds here at Bluebird Cove .... our hummingbirds arrived on the 26th. Not much in bloom so we had to be sure our nectar was full. Our White-throated Sparrows are still with us so the Chipping Sparrows have not arrived. 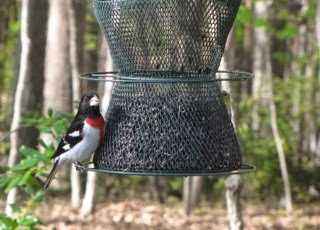 The biggest news is seeing a male Rose-breasted Grosbeak on the 27th. They migrate through here and are such a gorgeous bird to get a glimpse of. This one stayed in our backyard for a couple of hours. We have our Eastern Gray Tree Frogs back on the deck. Been hearing the male operettas to attract the females. They can really belt those songs out for such a tiny little thing. Read more about the Eastern Gray Tree Frog. Off the subject of God's Creation and on to the dull subject of computers ... I recently found a very cool and free application online that blocks ads on web pages. It also blocks ads on YouTube videos, Facebook ads, flashy banners, pop-ups, pop-unders and much more. I love it! Now I don't see any ads at all. It has a few other features such as being able to block all the social icons on websites, but that doesn't bother me since they're just small icons and do not distract my attention from what I am on the website to read. I use Firefox as my Mac browser and it puts a small icon for this application on the browser header bar so that I can make changes such as disabling it for a particular website page you are on. Haven't found any reason to do that yet! [grin] It also has a feature that allows you to disable malware domains known to spread malware, protecting your computer against viruses, Trojan horses, worms, spy and adware. One of my favorite features is that it disables tracking. With every browsing session, there are multiple firms tracking your online activity and browsing history. It has been so annoying to me that when I go to Amazon.com to check out an item so I can read reviews before purchasing local if possible, that item begins to show up as an ad on many of the sites I visit thereafter. Besides feeling like I'm being harassed to buy, why do they get to know what I've been looking at online? There are hundreds of ad agencies tracking your every move, but with Adblock Plus you can easily disable all tracking, and browse the web truly anonymously. And check this out .... According to Stanford University research, the Adblock Plus tracking protection filters are the most efficient of all available tracking protection solutions. So what are you waiting for - it's FREE? Check out AdBlockPlus.org. Agave syrup has recently become a popular, healthy alternative to sugar. The makers of agave syrup claim that the natural sweetener raises blood sugar less than regular cane sugar and say that because it’s so sweet, you can get away with using less of it and thus save on calories. Despite being marketed as a health product — and in particular, a good vegan alternative to honey — it has been found that agave syrup actually contains more fructose than high fructose corn syrup. A study from the Glycemic Research Institute cited by the Wall Street Journal said that diabetics experienced “severe and dangerous side effects” during the testing of agave syrup, and several people had to be hospitalized. Agave is between 1.4 and 1.6 times sweeter than sugar and actually has more calories than sugar. Jell-O is made of gelatin, which is itself made of the collagen found in animal protein. Sources of that animal protein include various combinations of bones, hooves, and skin from pigs, cows, and fish. While Jell-O has a strange cult fixation among the Mormon community, people who practice religions that inhibit the consumption of certain types of meat have to skip it entirely, as Jell-O packaging doesn’t specify what type of animal was used in the production of the gelatin. Some potential good news for Jell-O-loving vegetarians? There have been recent experiments with making gelatin from human DNA fragments. Gives a whole new meaning to the company’s 90s slogan: "Jell-O…it’s alive!" doesn’t it? I will close with an awesome quote sent to me by my friend, Elva: "I want to be so full of Christ that if a mosquito bites me it flies away singing there is power in the blood." Much Peace and Many Blessings to YOU!